Over the years (since 2005), I have seen logs of strange random DNS requests done, on the multiple DNS / BIND servers I have maintained. I usually chalked it up to some Windows malware. However, I have starting noticing it also is coming from Linux and Mac clients, lately. Again I thought it could be due to some malicious browser plug-in(s). However, while debugging a Google Chrome browser issue, in my newly installed Macbook Pro/Chrome, using the URL chrome://net-internals/#dns, I found similar requests in my Chrome DNS statistics page. My Chrome browser has rather innocuous plug-ins installed and no apparent signs of malware. I have my honest doubts whether it should be or not malicious activity. What is happening? (As seen in the image, pnxcygqqemww, ryzypwbheguutkd, and snplueo DNS names requests made by Chrome). I ended up digging, in the Internet, a series of posts/bug reports about random DNS requests, made by Chrome. The conclusion is those "random" DNS requests are neither generated by malware nor by plugins/add-ons. Such DNS requests are done intentionally by Chrome itself, to find out if it can deal properly with phrase searches in the address bar. If you type in a single-word search query, chrome needs to send a DNS request to check if this might be a single-word host name: For example, "test" might be a search for "test" or a navigation to "http://test". If the query ends up being a host, chrome shows an infobar that asks "did you mean to go to 'test' instead". For performance reasons, the DNS query needs to be asynchronous. Now some ISPs started showing ads for non-existent domain names ( http://en.wikipedia.org/wiki/DNS_hijacking ), meaning Chrome would always show that infobar for every single-word query. Since this is annoying, chrome now sends three random DNS requests at startup, and if they all resolve (to the same IP, I think), it now knows not to show the "did you mean" infobar for single-word queries that resolve to that IP. There are also hints those random requests are made at seemingly random intervals, and not just when starting Chrome. At least, they happen each time the current network interface goes up/gets a new IP address. About another link related to the theme from @Gilles, Unusual HEAD requests to nonsense URLs from Chrome - and hence adding to the question the proxy test setup ; you end up seeing proxy/Squid logs because when a proxy is configured in a browser, the requests are made via the proxy, and is up to the proxy to resolve the DNS requests. Because this function can be called during startup, when kicking off a URL fetch can eat up 20 ms of time, we delay seven seconds, which is hopefully long enough to be after startup, but still get results back quickly. This component sends requests to three randomly generated, and thus likely nonexistent, hostnames. If at least two redirect to the same hostname, this suggests the ISP is hijacking NXDOMAIN, and the omnibox should treat similar redirected navigations as 'failed' when deciding whether to prompt the user with a 'did you mean to navigate' infobar for certain search inputs. trigger: "On startup and when IP address of the computer changes." We generate a random hostname with between 7 and 15 characters. So, the conclusion is that those random DNS request names are not a manifestation of malware behaviour ; they are probes for Chrome/Chromium to find out what it can do concerning at least searches. // If another fetch operation is still running, cancel it. // Create traffic annotation tag. "This component sends requests to three randomly generated, and "
"thus likely nonexistent, hostnames. If at least two redirect to "
"the same hostname, this suggests the ISP is hijacking NXDOMAIN, "
"and the omnibox should treat similar redirected navigations as "
"'failed' when deciding whether to prompt the user with a 'did you "
"mean to navigate' infobar for certain search inputs." data: "None, this is just an empty request." setting: "This feature cannot be disabled by settings." "Not implemented, considered not useful." // Start three fetchers on random hostnames. // We generate a random hostname with between 7 and 15 characters. // We don't want these fetches to affect existing state in the profile. // Delete the fetcher on this function's exit. // origin to that; otherwise we set it to nothing. // |original_url|, based on the IntranetRedirectDetector's RedirectOrigin(). Slightly related: Mixed case DNS requests - Malware in my network? Not the answer you're looking for? Browse other questions tagged security dns chrome or ask your own question. 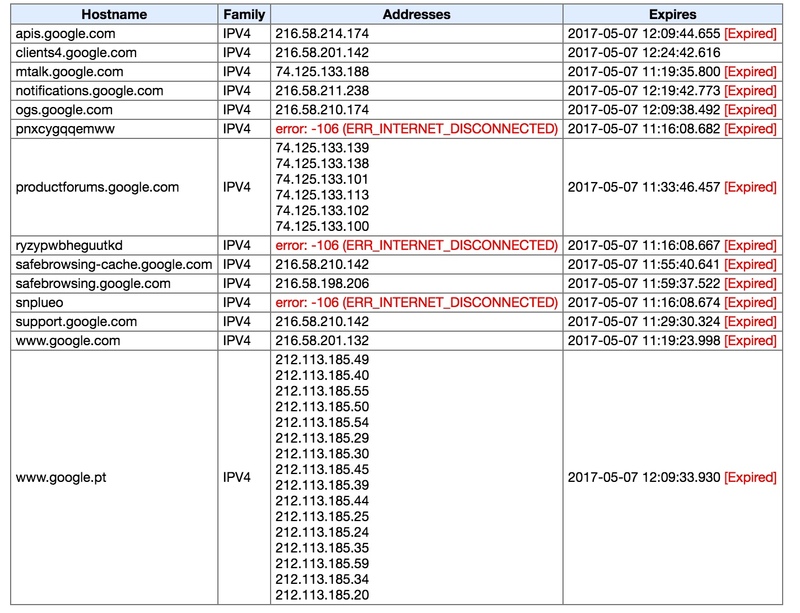 Mixed case DNS requests - Malware in my network? Keeping Pushbullet for Chrome active with Chrome closed?